An electrical coaxial connector assembly (20) is disclosed having filtered isolation means (36) for isolating the connector (21) from ground (90). The assembly includes a coaxial connector having an outer shell, the shell having first and second portions (22, 26), the second portion (26) extending outwardly from the first portion (22), the second portion (26) including means for being mounted to a conductive panel member (90); isolation means (36) having first and second dielectric members (64, 80) which cooperate with each other to provide a dielectric passageway through a cutout of a panel member (90) to which the coaxial connector (21) is to be mounted; and at least one electronic component (68) mounted to the first dielectric member (64). Each dielectric member (64, 80) has an aperture extending therethrough for receiving said second portion (26) of said conductive shell. The first dielectric member (64) further includes at least one laterally extending flange section providing a respective substrate to which at least one electrical component (68) is mountable, a conductive circuit means (38) being secured to a surface of said peripheral flange and the at least one lateral flange section, the circuit means 38 including a portion subst­antially surrounding the aperture in the member (64) and adapted to engage said conductive shell of said coaxial connector (21) and establish an electrical connection therewith. At least one electrical component (68) is mounted to said first dielectric member. Component (68) includes at least a first contact means (70) connected to conductive circuit means (38) and a second contact means (72) adapted to be electrically connected with said conductive panel member (90) whereby the at least one electrical component (68) completes an electrical circuit and provides filtering means between the conductive shell of the coaxial connector and conductive panel member (90). This invention relates to electrical connectors and more particularly to coaxial connectors having means for providing protection against electromagnetic and radio frequency interference in data communication systems. Electrical circuitry often must be protected from disruptions caused by electromagnetic interference (EMI) and radio frequency interference (RFI) entering the system. In addition to protecting electronic equipment against EMI/RFI energy, there is also a need to protect the equipment against power surges owing to electrostatic discharges (ESD) and electromagnetic pulse (EMP). The high voltage generated by ESD and EMP can damage voltage sensitive integrated circuits and the like. The present invention relates to data transmission systems for transmitting information between a master unit and one or more remote units of a subordinated system or between subordinated terminal units in systems known generally as local area network or wide area network systems. In interconnecting equipment in such systems it is necessary to both transmit and receive information from other members in the system. Generally, these systems use a coaxial connector comprised of an inner signal line and an outer shield member to filter interference from the line. Both the sending and receiving signal lines are interconnected by such coaxial connectors. This requires a plurality of coaxial transmission lines be established between various units within the system. With the wide use of such systems, it is desirable to have a more cost effective system wherein one coaxial connector transmission line can be used as both the sending and receiving line. In such a system, the shield of the coaxial connector is used as a return line instead of a shield for the outgoing signal. The return line then becomes an unshielded signal line and must be filtered to prevent spurious signals from entering the electronic equipment. It is necessary, therefore, to isolate the ground system of the equipment from the shield, now signal line, of the coaxial connector. Generally, the isolation between the connector and ground is accomplished by the use of isolation bushings, one placed between the connector and the back panel of the equipment, and the second placed between the back panel and the mounting means used to mount the connector to the back panel of the equipment. Filtering between the connector and ground has been accomplished by the use of leaded capacitive devices connected between the outer shell of the coaxial connector and the ground system of the electronic unit such as a terminal, thus isolating AC current from the DC signal line and transmitting the AC current to ground. Since leaded devices have an extra impedance associated with the leads it is desirable to have a means for isolating the AC current that uses unleaded devices. In many instances it is desirable to have an external filtering device that is an "add-on" device to provide filtering to an already existing non-filtered connector. This is particularly desirable in instances when the same basic connector may be used in a number of different applications, each having different filtering requirements. It is also desirable that a method of making the devices be found that will lend itself to automation of the assembly line by robotic devices and the like thus enabling filtered connectors to be manufactured in a more cost effective manner. In accordance with the present invention, an electrical coaxial connector assembly is provided with a filtered isolation means for isolating the connector from ground. The assembly includes a coaxial connector having an outer shell, the shell having first and second portions the second portion extending outwardly from the first portion. The second portion includes means for being mounted to a conductive panel member. Isolation means comprising first and second dielectric members cooperate with each other to provide a dielectric passageway through a cutout of a panel member to which the coaxial connector is to be mounted. Each dielectric member has an aperture extending therethrough for receiving the second portion of conductive shell. The first and second dielectric members include bushing sections extending from surfaces proximate the panel member to engage and thereby form the passageway through the panel member cutout. The first and second dielectric members further include peripheral flanges to extend along major surfaces of the panel member about the periphery of the cutout. The assembly is characterized in that: the first dielectric member further includes at least one laterally extending flange section providing a respective substrate to which at least one electrical component is mountable. A conductive circuit means is secured to a surface of the peripheral flange and the at least one lateral flange section, the flange surface being remote from said panel member the circuit means including a portion substantially surrounding aperture and adapted to engage the conductive shell of coaxial connector and establish an electrical connection therewith. The assembly includes at least one electrical component mounted to the first dielectric member including at least a first contact means connected to conductive circuit means and including a second contact means adapted to be electrically connected with the conductive panel member whereby the at least one electrical component completes an electrical circuit and provides filtering means between the conductive shell of the connector and the conductive panel member. In accordance with the present invention, an electrical component is also provided, which can be secured to an electrical article such as an electrical connector, the component being engageable to at least one circuit path of the article to providing filtering for the selected circuit path or paths. The electrical component is comprised of a dielectric housing member having at least one contact member secured therein and housing at least one filter receiving aperture along a first face thereof. The at least one contact member has first and second contact portions, the first contact portion being engageable with the at least one circuit path of the article. The second contact portion is exposed along a bottom surface of the filter receiving aperture of the housing member. A third contact portion, paired with the second contact portion and spaced therefrom, is exposed along the bottom aperture surfaces of the housing member. The component further includes a fourth contact portion, which extends outwardly from the third contact portion, the fourth contact portion being adapted to be engaged by grounding means. A filter member is disposed in the at least one filter receiving aperture and is electrically joined to the pair of second and third contact portions. It is an object of the invention to provide a filtering device for coaxial connectors wherein the outer conductor of the coaxial connector must be isolated from the system or equipment ground. It is an object of the present invention to provide electrical filtering means that can be externally mounted to an electrical connector or other electrical article. It is another article of the invention to provide a filtering device that can be added on to an existing unfiltered connector. It is a further object of the invention to provide an external filtering device that lends itself to automated assembly procedures. It is another object of the invention to provide a filtering device which can be manufactured in a continuous strip. Another object of the invention is to provide a method for manufacturing a filter device that may be used to retrofit existing connectors. The invention itself, together with further objects and its attendant advantages, will be best understood by reference to the following detailed description, taken in conjunction with the accompanying drawings. FIGURE 5A is a cross-sectional view of the device taken along 5A, 5A of FIGURE 5. FIGURE 7B shows the underside of the device of FIGURE 7A. FIGURES 8A, B, and C are electrical schematic diagrams of the present invention. Referring now to Figures 1 through 3. The connector assembly 20 is comprised of a coaxial connector 21 having a filtering device 36 mounted thereto for isolating spurious signals between connector 21 and an isolated ground panel 90. Connector 21, which is illustrated in these Figures, is a coaxial connector having a bayonet coupling and is known in the art as a BNC connector. It is to be understood that this connector is for illustrative purposes only and that other types of coaxial connectors may also be used in accordance with this invention. Connector 21 is comprised of a conductive outer body having first and second portions, the first being a rectangular block portion 22 and the second being a cylindrical portion 26 extending outwardly therefrom which forms the shield or outer conductor of the connector and an inner conductor (not shown). Cylindrical portion 26 further has external threads 28 thereon for securing mounting means thereto when connector 21 is mounted to a back panel 90 or the like. Cylindrical portion 26 further has radial projecting prongs 32 known as bayonet couplings at a forward end thereof. Connector assembly 20 further includes dielectric isolation means comprising first isolation bushing member 64 and second isolation bushing member 80, washer 82 and nut 84. As is best seen in Figures 2 and 3, filter device 36 is mounted to first bushing member 64 having aperture 65 therein dimensioned to be received by cylindrical portion 26 so that filter assembly 36 lies against wall 23 of body portion 22 in the assembled device. Second isolation bushing member 80, washer 82, and nut 84 have apertures 81, 83, and 85 therein for being received over the conductive cylindrical portion 26 and threaded portion 28 with nut 84 being securable to threaded portion 28. Referring now to Figures 4 through 6, a filtering device 38 is designed to be used with an electrical article to provide filtering for selected circuit paths of the articles. Device or component 38 is comprised of a plurality of contact members 40, a dielectric housing member 56 and filter members generally numbered 68. Six filter members 68a-f are used as seen in Figure 5. Contact members 40 have first and second contact portions 42 and 46 respectively. First contact portions 42 are engageable with corresponding contact portions of an electrical article. First contact portions 42 are secured in the housing member 56. Dielectric housing member 56 includes a plurality of filter receiving apertures 60 along a first face 58 thereof, as best seen in Figure 5A. Second contact portions 46 are exposed along a bottom surface 62 of respective apertures 60. Third contact portions 50 are paired with second contact portions 46 and are spaced therefrom at 48. Third contact portions 50 are also exposed along the bottom surface 62 of respective filter receiving apertures 60. Fourth contact portions 52 are secured in housing member 56, the fourth contact portions 52 extending outwardly from the third contact portion 50 and being adapted to be engaged by grounding means. A plurality of filter members 68 are disposed in respective filter receiving apertures 60 of housing member 56 and are electrically joined to respective pairs of second contact portions 46 and third contact portions 50. The filter members 68 are surface mounted components having a dielectric body with first and second conductive portions or contact means 70, 72 thereon for mounting to pairs of second and third contact portions 46 and 50. The number of filter members used will depend upon the desired amount of capacitance or other electrical properties desired in the connector. Filter members 68 are surface mounted components such as chip capacitors, resistors, uni-or bi-polar diodes or the like. First contact portions 42 further have connecting means 44 for electrically connecting first contact portions 42 to conductive shell of connector 21. In the embodiment shown, connecting means 44 is a ring member having aperture 45 therein for receiving cylindrical portion 26 and threaded portion 28 of connector 21 therethrough. In the assembled connector, ring member 44 lies against wall 23 of block portion 22. In the preferred embodiment, first isolation bushing member 64 is formed concomitantly with the dielectric housing member 56 to form a single unit. Bushing member 64 has aperture 65 therein for receiving or dimensioned to be mounted over connector barrel portion 26 in the same manner as previously described. Bushing member 64 further has aperture 66 therein as best seen in Figure 6, which is in alignment with the space 48 between second and third paired contact portions 46, 50 respectively. Electrical device 38 is made in the same manner as the electrical device described in PCT/US87/03076, International Publication Number WO 88/05218, published July 14, 1988. The formation of electrical device 38 therefore will be summarized in general terms. As illustrated in Figure 4, electrical device 38 preferably is made in continuous form by stamping and forming a plurality of lead frames 92 in a strip of suitable flat stock metal such as copper, phosbronze, or the like as known in the art. The strip is first stamped to form first and second carrier strips 94, 96 having a plurality of essentially parallel cross bar members or contact means 82 extending from carrier strip 78. As is shown in Figure 4A. Cross bar members 98 become contact member sections 40, 46, 50 and 52 in the assembled device. Carrier strips 94, 96 have apertures 95 and 97 therein which are used for aligning the strip in the manufacturing and assembly process. If desired cross bar members 98 may be plated on the desired contact area. Housing members 56 and isolating bushing members 64, are then insert molded around portions of the stamped members, each housing encompassing the desired number of cross-bar members. A plurality of filter receiving apertures 60 are also formed, one aperture 60 being associated with each cross member 82 within housing 56. The material used for molding the housings is preferable one that will withstand the temperatures associated with vapor flow soldering techniques. One preferred material is polyphenylene sulfide, available from Phillips Petroleum Co. under the trade name RytonR. Other suitable materials are known in the art. Figure 4 shows the structure of the metal portion during various stages of the assembly. When the member is first formed, cross-bar members 98 extend between those portions which will become second and third contact portions 46, 50, respectively. After the housing members and bushing members are formed, a portion of the cross-bar members 98 is removed at 28 to form the contact portions of device 38. Concomitantly, a portion of the underlying dielectric housing material and bushing material is also removed to form cavity 66 in the bushing member as best seen from the back view in Figure 6. After devices 38 have been removed from the frame, fourth contact portion 52 is formed around the edge of bushing member 64 and lies on the undersurface thereof. Lastly, filter members 68a-f are mounted and preferably soldered in their respective apertures. As can be appreciated, filter devices 38 can be formed on the strip while remaining attached to carrier strips 94 and 96. At that stage, they may be rolled onto a reel (not shown) until device 38 is ready to be assembled to an article. At that time, individual devices 38 may be severed and fourth contact portions 52 formed around the edge of bushing member 64. The process for making device 38 lends itself to automation since the metal strip may be stamped and formed, rolled on a reel (not shown), and later formed into electrical devices 38 in accordance with the invention. Once housing members 56 and bushings 64 have been molded, the strip is moved to a stamping station to stamp and form the device of the desired configuration. insertion of the filter members 68 lends itself to pick and place robotic system. The well defined apertures 60 can be aligned so that the equipment can place filter members 68 between the second and third contact portions 46 and 50 at selected locations. Figures 7A and 7B illustrate a further embodiment 138 of the filtering device wherein the housing member 156 has one filter receiving aperture 60 therein for receiving filter member 168. Filter member 168 is preferably a capacitor having first and second contact portions 170, 172 thereon. The single capacitor or electrical component has the same filtering capabilities as a plurality of capacitors shown in the previous embodiment. In this embodiment, there is only one first contact portion (not shown) on ring member 144 with one fourth connector portion 152 wrapping around bushing member 164. Figure 7B shows the single aperture 165 formed on the undersurface of bushing member 164. Figure 8 shows the electrical schematic drawing of the embodiment disclosed in this application. Figure 7A is a schematic drawing for the embodiment shown in Figure 5 wherein the connector has inner conductor 101, outer conductor 103 and the ground conductor is represented as 105. Figure 8A shows six capacitive elements in parallel between inner conductor 103 and ground 105. Figure 8B shows the schematic drawing for the alternative embodiment shown in Figure 7 wherein one capacitor takes the place of six smaller capacitors. Figure 8C shows a further alternative embodiment wherein one or more of the capacitive elements shown in Figure 5 is replaced by a blocking diode 107. It is to be understood that the electrical connectors used with the present device are representative samples only. It is to be further understood that the form, shape and types of connectors with which this device may be used are numerous. By filtering electrical connectors with an externally mounted filtering device, it is possible to selectively filter lines by omitting filter members from the various apertures. This allows the same basic connector to be filtered readily, in a variety of configurations and in a cost effective manner. By making a filtered device in accordance with this manner, the filtering device lends itself to cost effective manufacturing process which includes automatic equipment such as pick and place robots. Lead frame technology and insert molding lend themselves to continued automated manufacturing process which minimize handling of the device as well as time and labor. The device uses small surface filters, capacitors, transient suppression diodes, resistors or other components that are designed to be in parallel with the circuit, between signal line and ground. The components used for any one connector need not be identical and selected frequencies may be controlled by placing filter devices of varying capabilities at selected locations. at least one electrical component (68) is mounted to the first dielectric member including at least a first contact means (70) connected to said conductive circuit means (38) and including a second contact means (72) adapted to be electrically connected with the conductive panel member (90) whereby the at least one electrical component (68) completes an electrical circuit and provides filtering means between the conductive shell of the connector and the conductive panel member (90). 2. The electrical coaxial connector assembly as described in claim 3 wherein the first dielectric member (64) includes two laterally extending flange sections, each flange section providing a respective substrate to which at least one electrical component (68) is mountable. 3. The electrical coaxial connector assembly as described in claim 1 or 2 wherein conductive circuit means (38) includes first and at least one second contact portions (42, 46), the first contact portion (42) being electrically engageable with the conductive shell and the at least one second contact portion (46) being electrically connectable to first contact means (70) of the at least one electrical component (68), circuit means (38) further including at least one third and at least one fourth contact portions (50, 52), the at least one third contact portion (50) being spaced from and paired with the at least one second contact portion (46) and electrically connectable to second contact means (72) of the at least one electrical component (68) and the at least one fourth contact portion (52) extending from the at least one third contact portion (50) and electrically engageable to conductive panel (90). 4. The electrical coaxial connector assembly as described in claim 1 or 2 wherein each lateral flange section further includes dielectric housing means (56) having at least one respective component receiving aperture (60) therein for receiving at least one electrical component (68), the at least one second and at least one third contact portions (46, 50) of circuit means (38) being exposed along the bottom surface (62) of aperture (60) and electrically connected to respective first and second contact portions (70, 72) of the at least one electrical component (68). a plurality of electrical components (68) mounted to the first dielectric member (64), each component (68) including at least a first contact means (70) connected to conductive circuit means (38) and each component (68) including a second contact means (72) adapted to be electrically connected with conductive panel member (90) whereby each of the plurality of electrical components (68) completes an electrical circuit and provides filtering means between the conductive shell and conductive panel member (90). 6. The electrical coaxial connector assembly as described in claim 5 wherein said conductive circuit means (38) includes first and a plurality of second contact portions (42, 46), the first contact portion (42) being electrically engageable with the conductive shell and each of the plurality of second contact portions (46) being electrically connectable to the first contact means (70) of respective ones of the plurality of electrical components (68), the circuit means (38) further including a plurality of third and fourth contact portions (50, 52), each of the plurality of third contact portions (50) being spaced from and paired with respective ones of the plurality of second contact portions (46) and electrically connectable to the second contact means (72) of respective ones of the plurality of electrical components (68) and each of the plurality of fourth contact portions (52) extending from respective ones of the plurality of third contact portions (50) and electrically engageable to conductive panel (90). 7. The electrical coaxial connector assembly as described in claim 6 wherein the lateral flange sections further include dielectric housing means (56) having at least one respective component receiving aperture (60) therein for receiving electrical components (68) therein, respective pairs of the second and said third contact portions (46, 50) of circuit means (38) being exposed along the bottom surface (62) of aperture (60) and electrically connected to respective first and second contact portions (70, 72) of the electrical components (68) mounted therein. 8. 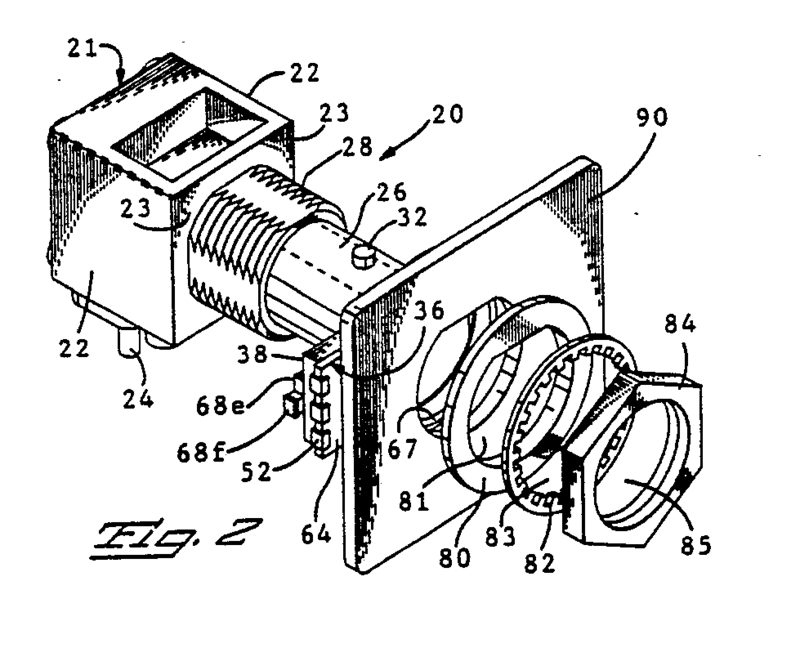 The electrical coaxial connector assembly as described in claim 6 wherein the lateral flange sections further include dielectric housing means (56) having a plurality of component receiving apertures (60) therein for receiving respective electrical components (68) therein, respective pairs of the second and said third contact portions (46, 50) of the circuit means being exposed along the bottom surface (62) of respective ones of the apertures (60) and electrically connected to respective first and second contact portions (70, 72) of the electrical components (68) mounted therein. 9. The electrical coaxial connector assembly as described in claim 1 or 5 wherein the at least one electrical component (68) is selected from the group consisting of chip capacitors, resistors, unipolar diodes and bipolar diodes.